Ryan Blackwell was a versatile forward who started three seasons for Syracuse. Blackwell was a hard working player, who did all of the little things well. He was a good ball handler, strong defender, and strong rebounder. 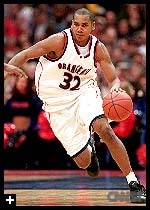 Blackwell played basketball as a freshman at the University of Illinois. He was unhappy with the style of play and his playing time, so he transferred to Syracuse after that season. He had played 30 games at Illinois (all as a reserve), scoring 118 points, for an average of 3.9 ppg. He would lead the team in rebounding again his junior season, along with most minutes played. During his senior season, Blackwell helped the Orangemen win the Big East regular season championship. He was named to the All Big East Third Team that season. Blackwell would play professional basketball overseas in Japan, England, France, Portugal and Uruguay.